It was a very anticipated night. The 1992 US Open Men’s finals. My hero Edberg was up against Pete Sampras. Two great champions. I remembered how Edberg had demolished Courier in the 1991 final. 6-2, 6-4, 6-0. Back in India, the matches would start nearing midnight and the next day being Monday one would have to get to work too. Thankfully, Stefan finished the match in record time and I could catch some sleep. But 1992 seemed to be different. Edberg had reached the finals after three consecutive five-setters, against Krajicek, Lendl and a plus-5 hour match against the indefatigable Chang. Sampras on the other hand had it far easier, having played only one five-setter against Guy Forget and then annihilating Alexander Volkov, till he fashioned a fairly comfortable 4-set win against the World no 1 Courier. 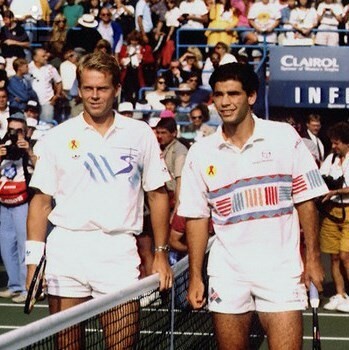 Sampras was the much younger man but Edberg was the defending champion and seeded no 2, one above Sampras. But I was quite concerned for his fitness levels, ( not his desire, mind you ) taking into consideration the fact that he had to battle and prevail in three five-setters. The match started and soon Sampras took the first set. My wife called out saying that she feels that it may happen soon. I responded by saying “Hang on. Sampras has taken the first set. Looks like it will be a quick one.” Not that I believed myself, but had to manage the situation. Then things turned. Edberg took the second set. I told my wife “Take it easy. Edberg has won the second set. The tide is turning. He will demolish Pete from now onwards.” I didn’t believe myself this time around, but had to keep things on a positive note. The third set was a humdinger. Went to the tie-breaker, while my obedient wife was taking it easy. Edberg took it 7-5 in the breaker. I heaved a sigh of relief, but not too much as Chang too was down 2 sets to 1 and then won the fourth set , taking it to the fifth. Sampras fortunately was no Chang on that day, as he capitulated 2–6 in the fourth and Edberg realizing my predicament didn’t even wait for Pete to come to the net, but jumped over it to accost Pete and shake his hands. My wife was quite thrilled not only for me but for also the fact that the match being over, she would have my undivided attention to the impending new addition to the family. In the morning, my daughter was born – now a huge Fedfan. A very bad year for Fedfans. Federer had lost to Djokovic in straight sets in the Australian Open semifinals. Federer had lost to Nadal – a heart-breaking Wimbledon final in fading light. Federer had lost to James Blake in the quarterfinals of the Beijing Olympics. The only reason to cheer was the doubles gold. But that was doubles. On his own Fed was having a wretched year and so were we. My daughter and me. And then it was the US Open. The trends were clearly not on Fed’s side. But hey presto, lo behold and all that, Fed was in the final again. Sweet revenge against Djokovic in the semis. So we had a man who was experiencing his worst year, losing both the Australian & Wimbledon crowns and a humiliating defeat in the French Open. Less said about the Olympics the better. And on the other side, a raw 21 year old making his first appearance on the big stage but full of confidence having taken out the World No 1 – Nadal in the semis. The finals were on a Monday and a bit earlier relatively speaking in Muscat. The first set was easy for Fed – 6–2. We wondered whether this could last. Is Fed flattering to deceive? Is Murray initially just overwhelmed due to the situation and will soon settle down? And as it happened, the set continued on serve till 5 all. Fed held to 6-5 and then broke Andy to win the set. A tough fight from Andy for sure. But poor Andy was demoralized and just about managed to save a bagel in the final set, though to his credit did manage to prolong the game by breaking Fed when he was serving for the 5-in-a-row championship. Soon the lion roared and my daughter screamed – both in sheer delight. Fed has not won the US Open since then, enduring many heart-breaking losses, one against Delpo in the 2009 final and a couple against Djokovic in 2010 & 2011 semis. But the finals this year is on 14th of September, 23 years to the day my daughter was born. We all hope Roger gets to number 6 in NY… Great reading!!! Did anyone else get the chills when they read the last line!!? Lovely read Murli! I sure am hoping gets this one too… I know it’s going to be extremely hard but who knows… One can only hope. All ingredients of something great is there in Fed’s form as well as in his life. Would be a spectacular birthday celebration on 14th if Fed delivers! Hope for the best. Allez! Thanks for a cool post, Papa Murli. What a wonderful story, thanks for sharing. 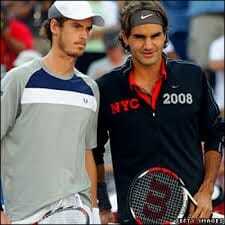 I watched the 2008 final recently and I had forgotten just how good Fed’s forehand was in that match. He wasn’t holding back at all. That would be a beautiful thing if Roger wins it this year. Novak avoided Murray and I’m not overly excited..
Federer and Murray/ Wawrinka Semis, Berdych Quarters. Rest of the route looks straight forward. Hi Murli… great write up. I especially liked the Edberg and Sampras summary . And the fact your wife is so close to given birth but the final comes first. Lol. Very funny. Hopefully this year federer can do something special. Fingers crossed. But one match at a time. Come on Roger! !! Thank You for sharing your story, a delight to read with some humor injected. Enjoyed it tremendously. Let us hope for a repeat of joy and roar across the globe….2015! Feds has a potentially tough draw, but it’s good to hear that’s an auspicious date. 🙂 As the great man said recently in regard to his ‘charge the net’ return, WHY NOT? Something tells me that……now a Dimitrov Fan (BabyFedFan) will be born!? really NICCCCEEEEEEE!!! Murli, you better be right, or you will be banned from this website! Thanks so much for reading and appreciating. My wife always thinks that my daughter’s love for tennis is due to this incident. And she always finds it amusing when I relate it to others. The best thing about Fed is that he always keeps his fans hopeful. WIn or lose, when he plays there’s always a chance. Hope it’s this time. And Utch thanks for keeping the faith. Hi guys! Here’s Mr Seba’s new video. Enjoy Fed’s crazy returns! Murli: That was beautiful, thank you so much. I was a huge Edberg Fan and your essay brought back wonderful memories. Now I am an even bigger Federer Fan (if that’s possible) and hope all our dreams come true. I know 🙂 No more Super Saturdays this year. Technically though, Murli is in Muscat, so when the final starts I’m pretty sure it will be the 14th.